My name is Ashlee Self and this year I will be teaching Drama and Music in collaboration with Ken Sykes. I have had a varied performing arts background in music and drama, being a previous member of the Young Adelaide Voices and a long-term member of the Blackwood Players Inc. theatre company. This semester in Drama, we will be exploring Indigenous Australian Dreaming stories and elements of dance. Through this, students will be able to understand the meanings and motivations behind this rich oral history, understand that culture comes in many different forms and can be experienced through many different outlets. This semester we will be focussing on stage skills such as commitment to role, stage presence and stance, projection and body control. 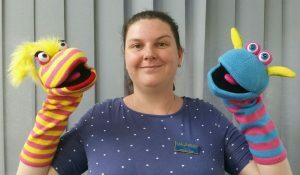 We will also be exploring appropriate classroom behaviours with the help of our ‘friends’, an assortment of puppets who individually teach lessons of appropriate voice levels, co-operation, respect and ‘having a go’. Drama provides the perfect environment for children to practice social skills, such as respecting personal space, safe use of body and respecting differences in opinion. It is also a great chance for children to practice skills that are transferable to everyday situations, such as dealing with unfamiliar scenarios, thinking on your feet and working with people outside of your friendship groups. I look forward to sharing my passion for the Arts with all my students! Mrs Self with her ‘friends’, Gloria and Edwin.